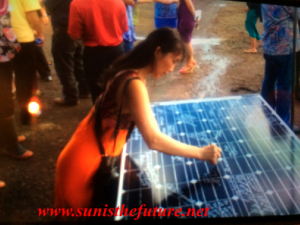 It is with tremendous awe and admiration that Sun Is The Future team took the trip and video recorded the Koloa Solar Dedication ceremony at Kauai, HI, on September 25, 2014. We found out that by Jan. of 2015, 80% of the peak daytime power demand at Kaua’i will be met by solar energy and 22% of the daily average will be met by renewable energy. 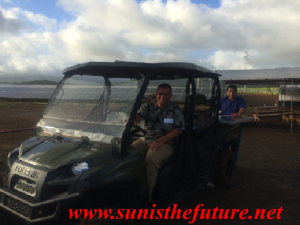 KIUC (Kaua’i Island Utility Cooperative) is definitely leading the way on planet earth in our transition toward Renewable Energy Age! This is especially impressive given the fact that Hawaii is the most fossil fuel dependent state in USA. Realizing that 50% of its total economy comes from tourism and military and the finite nature of fossil fuel, Hawaii actively tries to relieve its dependence from oil so to be less vulnerable to the fluctuation in oil prices and availability. This is mainly accomplished through various goals and roadmaps set by Hawaii Clean Energy Initiative. During the dedication ceremony, Allan A. Smith (Chairman of the Board of KIUC) welcomed every one. Then remarks were made by:David Bissell (President and CEO of KIUC), Tulsi Gabbard (U.S. House of Representatives), Bernard Carvalho Jr. (Mayor of County of Kaua’i), Hermina Morita (Chair of Hawai’i Public Utility Commission), Sheldon Petersen (CEO of National Rural Utilities Cooperative Finance Corporation), Peter Rive (Co-founder and Chief Technology Officer of SolarCity), Mike Gabbard (Hawai’i State Senate), Wanda Kau-Shibata (Kaua’i Representative), and Gov. Neil Abercrombie. Dedication and blessing was made by Kuma Sabra Kauka. It is easy to see the love, respect, care, and reverence the people of Kaua’l have for their land, resources, and energy. 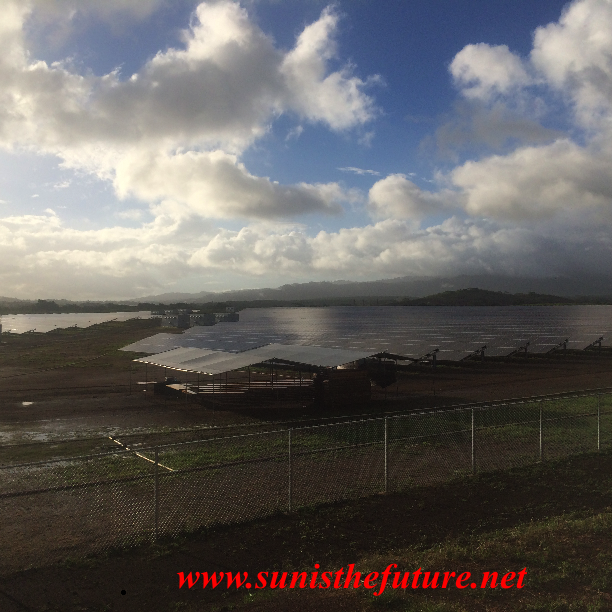 This 12 MW, $40 million solar array project is the largest solar array in HI. Contractor is Solar City and Landowner is Grove Farm. It contains 45,360 panels and started in Nov., 2013. The project will displace 1.7 million gallons of oil annually, eliminate 35,000 tons of emissions annually, and will generate enough energy to power 4,000 homes. It is a key part of KIUC’s strategy to use renewable resources to generate at least 50% of the island’s energy by 2023. KIUC is also making sure that there is a diverse portfolio of renewable energy, utilizing not just the solar power, but also wind- , biomass, and hydro- power. It is wonderful to see Senator Mike Gabbard’s of Hawaii (Chairman of the U.S. Senate Energy & Environment Committee for the past six years)’s excitement for this solar installation. It is understandable how Kaua’i and state of HI are able to arrive at the Solar Heaven ahead of all other states, surpassing its Hawaii Clean Energy Initiative of 2008 (goal of achieving 70% clean energy by 2030 with 30% from efficiency measures and 40% coming from locally generated renewable sources). But currently HI is at 18% renewable energy state-wide (the first bench mark for 2015 had a goal of 15% renewable energy). Of the 18% renewable energy: on the Big Island, 48.1% from renewables; on Maui, 29.1%; Kaua’i, 18.8%; Ouaha, 11.7%. 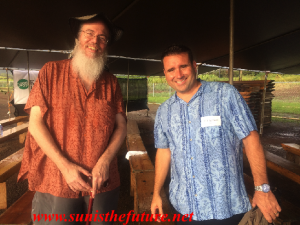 Yes, HI is going strong with solar and other renewable energies not only because Hawaiians or residents of Kaua’i are blessed with sunshine but because of their utility such as KIUC is continually looking for ways to collaborate and encourage their state legislators to move toward Renewable Energy. Most importantly, Kaua’i is blessed with island residents who aim to live in harmony and spirit of conservation with Mother Nature. Thumb up for KIUC! Hip! Hip! 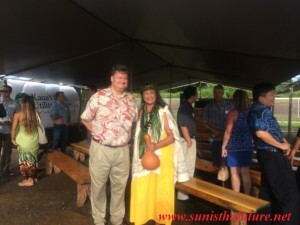 Hurray for Kaua’i and KIUC! We hope all other states in USA will look toward KIUC for their shining example during our earthly transition toward a Renewable and Clean Energy Future.